The Cradle of Humankind is an unassuming rolling vista, just an hour’s drive from both Johannesburg and Petoria. But it’s what has been hidden underneath the 180 square kilometres of scrubland for more than three million years that has recently been grabbing headlines. The incomplete skeletons of a potentially new pre-human ancestor, Homo naledi. Unearthed by professor Lee Berger and his team, the remains may present vital information about the evolution of humankind. The people at Maropeng are no strangers to ground-breaking (both literal and metaphorical) discoveries; in 1994 Little Foot – an almost complete Australopithecus was found. The painstaking work of excavating the remains is almost finalised and Little Foot will go on display at the Maropeng Visitor centre – three million and 23 years after he fell into the Sterkfontein Caves. The Tumouls building, designed to be reminiscent of an ancient underground burial mound, houses exhibitions showcasing paleontological discoveries from the UNESCO World Heritage Site. Popular with schools and families, the museum puts the findings in to historical, archaeological and environmental context with an underlining theme of inclusivity. Highly interactive, the exhibition centre includes a boat ride with a new area currently under renovation. Upwards of 53,000 hominin fossils have been found on the site – more than anywhere else in the world. 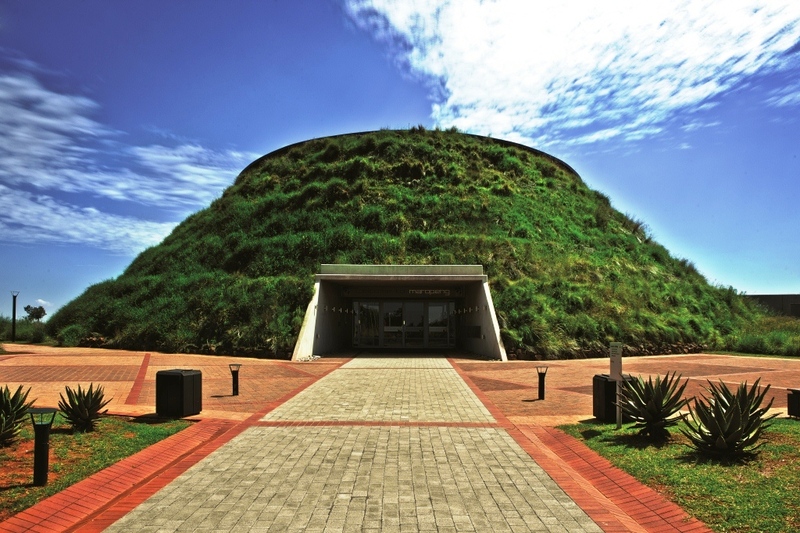 Maropeng, in the region of Gauteng, was granted its UNESCO status in 1999 because of its outstanding natural beauty and contribution to our understanding of humanity. The centre has world-class conference facilities, ideal for smaller business but with facilities for up to 320 delegates. The visitor centre, conference facilities and out-door amphitheatre are ideal for a memorable conferencing experience. The four-star Maropeng Boutique Hotel is a beautiful setting for a romantic get-away, or perfect for MICE travellers and families alike. Floor to ceiling windows in all of their 24-rooms provide exceptional sunset and sunrise views across the Witwaterberg and Magaliesberg ranges. Comfortable uniquely African décor adorns large king or twin rooms. More affordable dormitory style accommodation for up to 120 learners is catered for at the recently renovated Hominin House. Six en-suite rooms, a covered dining area and amphitheatre fire pit are uniquely set up for school trips to the historic site. The area offers a wide range of leisure activities such as hot-air ballooning, game-driving, biking and walking. Stick around until night fall when the skies come alive with a million stars – a new southern hemisphere perspective and fabulous way to contemplate you place in the universe. Resident astronomer Vincent Nettman is available to take guests on an extraordinary guided astronomical journey. Maropeng means ‘returning to place of origin’ in Setswana.